Late March Woods --- Ahhhh! I am sitting in the office typing and glancing out occasionally at the wonderous sky - filled with giant, puffy, floating clouds. The sun is shining and the window is open. We just got in from a walk in the woods, and I am SO glad we went. It was one of the first for Molly and me to go alone... at least since she was very small. Note her fabulously sensible shoes! Her thrift store shopping is very handy for creek stompin' too, as it turns out. I've never identified the above wildflower. The flowers resemble Spring Beauty and when they are blooming at the same time one needs to look closely to see a difference. These are a couple of inches taller, I think. the Spring Beauty isn't showing yet. No Trout Lily leaves yet either. I *think* this is a skunk cabbage. The leaves are very large when mature, about a foot high and resembling loose Romaine lettuce more than cabbage. However, I didn't see what was happening inside the rotting dark purple leaf at the top of the picture until I got it home and looked at it! Isn't that amazing! Ramps! Our ramps all survived! We planted them several different places and I found them in all of the spots. They are robust and strong. What a delight to find them! The trilliums that will accompany them aren't up yet. I loved the looks of this stick laying on the woodland floor. We decided it was a mushroom wand. Galls of some sort, I imagine. Might be fungus. Molly pushed on one of the puffy ones and said that a puff emerged - so it could be a puffball type of fungus. I would have missed this had I been alone. Molly found this and it was the only one we found of the thousands that will be out in a few short days. Bloodroot. Several patches of the Dutchman's Breeches are starting to poke their heads up, and uncurling their dusky leaves. The leaves seem to green up quickly in the light. We watched the goldfish congregating near the surface of the lake as we walked out of the woods. I cannot express how relaxing and centering that little walk was - how those few minutes seem to have changed everything. And if there was any doubt, Spring is indeed going to be arriving soon. 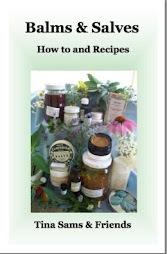 This is Week 5 of the Herbal Blog Contest. 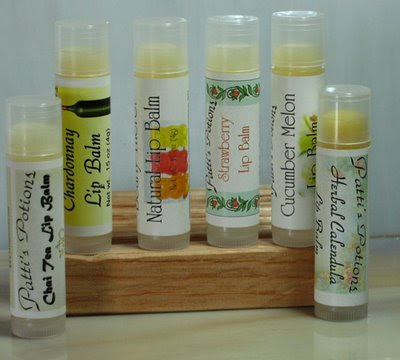 Friday March 27th to Thursday April 2nd.Featured this week are moisturizing Lip Balms from Patti’s Potions Natural Soaps, Ltd.Did you know that most lip balms contain petroleum products that are NOT eco-friendly? This is your opportunity to experience fine natural oils in your lip care experience. Ingredients: calendula infused olive oil, shea butter, natural beeswax, jojoba, castor, & vitamin E.
To win TWO of these luscious lip balms, simply enter by posting a comment in response to this blog entry and take a chance at winning!!! Don’t forget to include your email addy so we can contact the winner!The following blogs are also participating, so stop over to enter with them for additional chances to win AND the chance to explore some cool blogs. Keep coming back and keep entering. We have some great prizes coming up, and we'll be having the contests until the middle of May! This weekend, Maryanne Schwartz and I will begin the whirlwind of spring events with our first outing of the year. We will be speaking on Backyard Herbalism in the morning, and have a vendor table throughout the day. In the afternoon we will be teaching a workshop on handmade incense cones (participants will make and take a small batch). Other talks will be: Why Grow Your Own Medicine?/Planting a Medicinal Herb Garden by Rosanna King of King's Herb Nook.... Pennsylvania: History of a Horticultural Melting Pot, by Jeannine Vannais from Bowman's Hill Wildflower Preserve, and GREEN is the Color of Life & Health by Grace Lefever of Sonnewald Natural Foods. Afterwards, we begin preparing for the PA Herb Festival, April 17 & 18, where we will do a soapmaking demonstration and Susan Wittig Albert will be the speaking! It is the end of March now. Spring is officially here. Herbies are shifting into high gear. 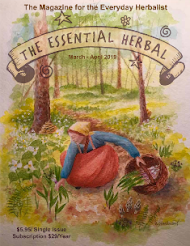 Here at The Essential Herbal, we are putting the finishing touches on the next issue so that we can have that in the mail before the insanity is in full swing. 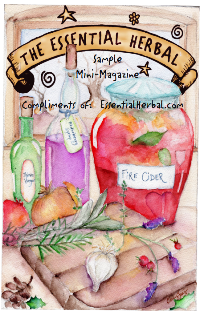 One of my favorite articles in the upcoming issue is about herbalists' workspaces. Several herbies were generous and sent pictures of their apothecaries, shipping areas, and kitchens. Very inspiring just to see how other people store their stuff or keep it organized! I got Molly to take my picture in the office here because that is one of my workspaces. The cover will be another of the workspaces here. I usually post other people's pictures here, so this is where I spend a good portion of my day. There are a lot of other things going on around here. The fun part of the year is closing in. We've been making and shipping soap. Apparently small luxuries are still quite popular. I've been trying to spend about an hour a day out weeding and fooling around outside on the days that are warm enough. Lots of Botanical Bead Powders need to be packaged for the coming festivals, and many of the products we make down at the soap company - balms and bathing herbs, scrubs and spritzes... all need to be stocked. I'm hosting an herbal swap that is due in a couple of weeks. So far the entries that have arrived are spectacular. I decided to up my game this morning with the last arrival, but it is something I'll be presenting in a lecture shortly, so it all works together. I believe that our calendars are about as full as we want them to be now, and at least until fall, we will start to decline invitations (unless they are really juicy, of course) to do presentations. It is impossible not to notice that as the sap rises and the plants around me begin to green up, the same thing is happening in a certain way to me. Everything quickens and the pace picks up. Winter is over. A new year begins. Last year at this time we did an issue that was devoted to the need to scale back, plant a garden, reduce, reuse, and recycle. 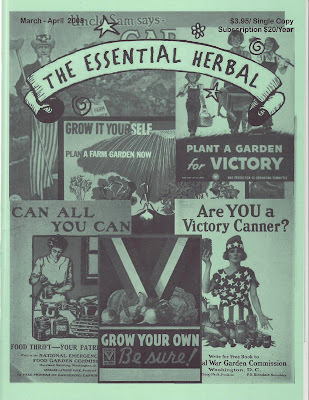 The cover is a collage of posters from the Victory Garden campaigns of the 1940's. The issue is sold out, and now these topics are getting huge coverage. We were just a little too early. Share it. Forward the link. Send it to your friends, and post it on the lists and forums you participate in. Post it to your own blog and share it with your readers. Help us spread this issue far and wide! Welcome to week 4 of our Herb Blog Group Contest! 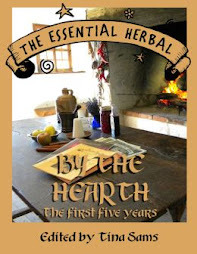 HerbsfromtheLabyrinth.com has a wide range of herbal products to choose from. Be sure to come back each week and comment for the contest. We have 10 weeks full of great prizes, so don't miss out! Every so often, I look at my daughter and her cousin, and realize that for them, these will be the good old days. It actually does help me to know that there will be a time when they will be older, looking back fondly on these times. They will laugh about the roving cells of terrorist chickens, the groundhogs, and the way we always ooh and aah over the baby horses up the road. Maybe they'll laugh about all the times Molly fell in the pond, or the time she drove into the row of blue spruces. Certainly some of Rob's fireworks displays will qualify. They already make fun of my sister and me, calling us "the mothers" and laughing about the way we do things. They'll remember the days of us scrambling to get out soap orders and issues of the magazine. The very idea of anyone wanting us to speak for their groups is completely hysterical to them, so that will be part of it too. They will also look back on this time with their uncle John very fondly, I suppose. At least I think so. It started with the repeated bouts of encephalopathy - oh how the kids enjoy that! Last time he was hospitalized for that (confusion and hallucinations), the kids would have stayed the whole time if we'd let them! So as I worry about how this affects the kids, it helps me to know that someday they will consider these times to be the good old days. We are in the tail end (we hope!) of waiting for a liver for our brother. He spent a couple of days in the hospital and came home last night. It gave us the impetus to get ourselves in gear and find coverage for all of the events that are coming up in the next 6 weeks. In this business, the next 2 months are what it's all about! The doctor drew us a picture yesterday and showed us what might be up and coming for John. A little outpatient procedure that might really help for the time being, it is called a TIPS procedure - Transjugular Intrahepatic Portosystemic Shunt - where they go in through the jugular and down into the liver to install a shunt to relieve pressure. This would result in less fluid build-up in his stomach. I am sharing this with you because sometimes I am not around. Some of you will worry about me, and so I want you to know what's going on. As long as we approach this together as a family, we are all ok. We should all always remember that these are the good old days. Now on a lighter note, spring is breathing down our necks, here. On the way out to the hospital the other day I noticed that the anise hyssop was sending up beautiful purple leaves, and that the luscious chickweed growing next to it is blooming. I want to get outside and pull up some of the deeply rooted (!!!) white bladderwort. Maybe I can do a little before the sun goes down. 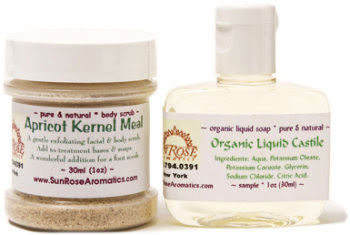 This week (#3) our herbal blog contest swings over to SunRose Aromatics, where Roe whips up the most delightful of aromatherapy and pampering products. For the week between Friday, March 13 and Thursday, March 19, you can enter simply by posting a comment and your email in response to this blog entry and take a chance at winning!!! Mix in the palm of your hand & then apply to your face. A wonderful exfoliate! Keep coming back and keep entering. We have some great prizes coming up, and we'll be having the contests til the middle of May! Yesterday was another of those precious days that feel like spring, well before spring is really here. You can't really work in the garden, but you can be outside feeling the sun on your skin. The roving bands of chickens were having a ball wandering all over the farm. I did manage to pull the stray turnips from last year and drag in the bamboo tipis and structures that dotted my garden (Bob grows bamboo, so I go a little crazy with it) just in case the tractor and plow wander up this way. My sister and I wandered down into the woods again. The redtail hawks are everywhere. Along the way, at the end of a row of trees we found something that Maryanne says is known as "buck rub" where they rub the velvet from their antlers. That is a phrase that struck my funny bone, and unfortunately for those around me, I've been busy finding ways to use it in various sentences. Buck rub is the bane of the tree farmer's existance, so it strikes me as even odder to only be hearing about this now, 20 years or more after they moved onto a tree farm! Could it be that my family, recognizing that the combination of my jr. high sense of humor plus an affinity for words would find the term too glorious not to bandy about? Ah well... Aye yam what aye yam. We found this little bronze fern-y thing. I don't know what it is, but I'm hoping that someone reading will! I do believe that it is normally green. As we got nearer to the house, I needed to check on the wintergreen that my sweetie and I dug up on our Autumn sojourn into the woods. Sure enough, there were 7 or 8 little rootlets doing fine, happily surviving the end of the winter. Whew! Next we headed in to the soap barn to make 8 batches of soap. We've been getting wholesale orders pretty steadily for the last few weeks, so we're needing to keep up. We slacked off pretty well through January and part of Feb., so we're paying now. One of the things we've decided is to allow ourselves to make some things that aren't really for wholesale, but are fun. So each session we have, we try to squeeze in something that we'll offer at the farmers market this summer and on my website. These are Salt Spa Bars. They have a healthy amount of salt added to the mixture before being poured into the mold. I personally don't like using them in the winter, but during the other three seasons they remind me of the shower you take after spending the day in the ocean - clean, fresh, and soft. The bluish green one is Ocean Rain and the reddish orange one is Yuzu. They average a little over 7 ounces each! They're on my site. For the week between Friday, March 6 and Thursday, March 12, you can enter simply by entering a comment in response to this blog entry and take a chance at winning Fairyland Cookie Cutter and Fairyland Recipe Card. Each cookie recipe comes with 1 "friend of the fairies" fairy cookie cutter and fairy sprinkles. Cutters include bird, dragonfly, fairy, gnome, flower, butterfly – she’ll choose one for you! So keep coming back and keep entering. We have some great prizes coming up, and we'll be having the contests til the middle of May! In like a lion! March forth, baby. A lot happens at this time of year. There can be many different types of weather in the same day, and sometimes it can even seem like we pass through a whole year's worth of seasons in a week. I'm about to skip off for a day at Radiance where we'll be doing a class on tub teas, and finished a gorgeous chamomile distillation yesterday, but don't want to get too far ahead of myself here. OH! 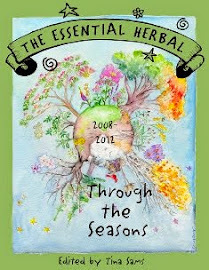 you still have 2 days to enter the contest to win a free subscription to The Essential Herbal. Scroll down 2 posts for details! The other day we went to the Mid-Atlantic Garden show in York. It's an interesting show at this time of year. Can't really buy plants for the yard yet, so the things that wind up catching my eye are garden accessories and products for around the home. This year I am sad to say that I didn't buy anything. I meant to pick up some goodies for a care package, but didn't see anything that worked. There were 3 or 4 soap companies there, but we do that ourselves. Maryanne found a great (and very reasonable) crock with "Lancaster County" glazed on it. That will work well with a soap display, since the name of her soap company is Lancaster County Soapworks, Etc. Heh! Marge Reppert hands out the Rosemary House's wonderful Calender of Events/catalog (which you can also see on-line) while Susanna handles the inside of the booth. I imagine that Nancy was back at the shop/tea room, taking care of that end of things. We always stop at their booth first to get our bearings. It wouldn't be the same if they weren't there! I was fond of the tree trunk carving. Love stuff like this! And then there was this little storm that ripped up the Eastern coast. Some got a foot. What we got blew into piles here and there, leaving most of the yard bare. Lots of drifting, but I was greatly amused to see that fully half of the driveway was dry as a bone...then Bob came up with the plow and did the other half (THANKS!!!) as soon as the snow stopped. I have decided this is the last bad storm of the winter. You know, the kind that cause a problem with traffic. Whew. Glad they're over with!